It’s going to be hard to explain what The Brittany Foundation in Acton, Calif., means to me, but I will do my best. Right now, I live in a one-bedroom apartment. I am gone for about 11 hours a day at work, so I can’t have my own dog right now. I volunteer at the dog shelter nearby every Saturday for my much needed dog time and have been for almost three years! The Brittany Foundation is really more of a sanctuary for all dogs, regardless of breed and age, and focuses on the unadoptable dogs: seniors, disabled, abused and/or media-condemned dogs. It is a no-kill, non-profit organization, so these dogs are able to live out their lives at the sanctuary and receive as much love and comfort as possible. Many of the dogs have couches in their kennel. All of them have dogloos, beds, blankets, toys and even sweaters. My job as a volunteer is to clean the kennels, walk dogs, give them love and treats! As of today, the shelter has six pit bulls. The other big dogs include three terrier mixes and a 10-year-old black lab. I’ve always loved all dogs, but there is a special place in my heart for pit bulls. I wish I could volunteer every day because I thoroughly enjoy my time at the shelter. They take better care of their dogs than any other shelter I’ve been to. My favorite dog at the shelter is Queenie, a 10-year-old pit bull. I love all the dogs there, but Queenie and I have bonded the most. She is white with red spots, crookedly cut ears, a huge smile and deep, soulful eyes. We have such a strong bond I call her my soul-dog. She is an absolute angel! She was recently diagnosed with kidney failure. When I can, I take her home with me for a sleepover, which we both love. I wish I could keep her, but I know she is in the best of care at the shelter, and she is already doing better with the help of Nancy. Nancy is the founder of this shelter and a miracle worker. She somehow manages to take care of all the dogs by herself – about 75 of them! 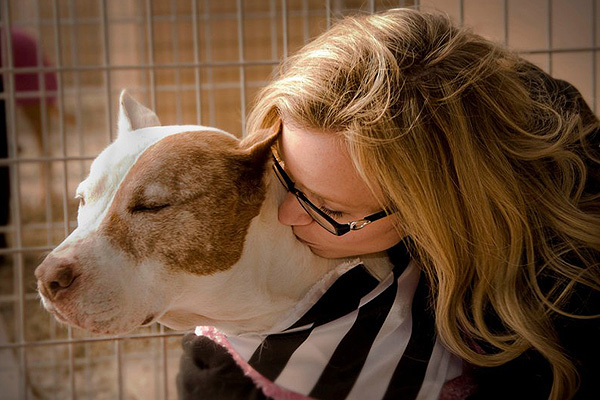 She has truly devoted her life to these dogs. She takes better care of the dogs than she takes care of herself! She is constantly cleaning, doing laundry, pooper scooping, making sure all the dogs are comfortable and keeping track of all their different needs. She never takes a weekend, sick day or vacation. She wears donated clothing, goes to sleep late and wakes up early every day. She juggles vet visits, grocery shopping, adoption events and feeding schedules. Without her, the shelter wouldn’t be here, and I wouldn’t have met Queenie. She is my inspiration and the reason I decided to make working with and helping animals my career. It makes me feel good that I am able to make a difference for these homeless dogs’ lives. I’ve been surrounded by dogs my whole life, so I couldn’t imagine not being able to see the dogs at the shelter every Saturday. A life without dogs is not a life I want to live. I think they help me more than I help them. What The Brittany Foundation means to me is that I get all the doggie kisses, hugs, smiles, wags, laughter and love that I need! Way to go, Vanessa! So proud of you. I have the pleasure of volunteering with Vanessa at The Brittany Foundation and she is an angel to the dogs, especially Queenie. Thank you for featuring Vanessa, an unsung hero who means everything to the Brittany Foundation and its dogs! @michsathe Thank you Michelle, Vanessa is clearly an incredible volunteer and we are thrilled to feature her and all the others that are unsung heroes all this month. Vanessa what an inspiration. I share your passion for pitties. Their spirits soar, despite the astounding ignorance that perpetuates the prejudice against them. Vanessa and Nancy make me feel humble.